Typical SaaS conversion rates are pretty dismal. A consensus of Quora experts put the average conversion rates between 3-5% with great being 8%. On its part, Sixteen Ventures, a SaaS consultancy firm, says it’s about 3% (based on industry research). Totango, a customer success platform, has rather low figures. It says the best SaaS companies had an overall 2% trial-to-paid-to-retained conversion rate compared to the average rate of 0.6%. How then do you jerk up conversion rates? How do you manage to get new users to stick around, use your product and achieve their first success? A highly personalized customer onboarding email campaign can help. It has the potential to engage users and bring them to a ‘wow’ moment. It is based on the premise that the same emails won’t work for all users (different strokes for different folks). 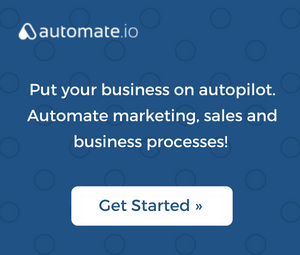 Personalized–Smart SaaS businesses know it’s a mistake to treat sign-ups in the same way. Two people using your product can still have very different needs and mindsets. Your onboarding emails should take that into cognizance. 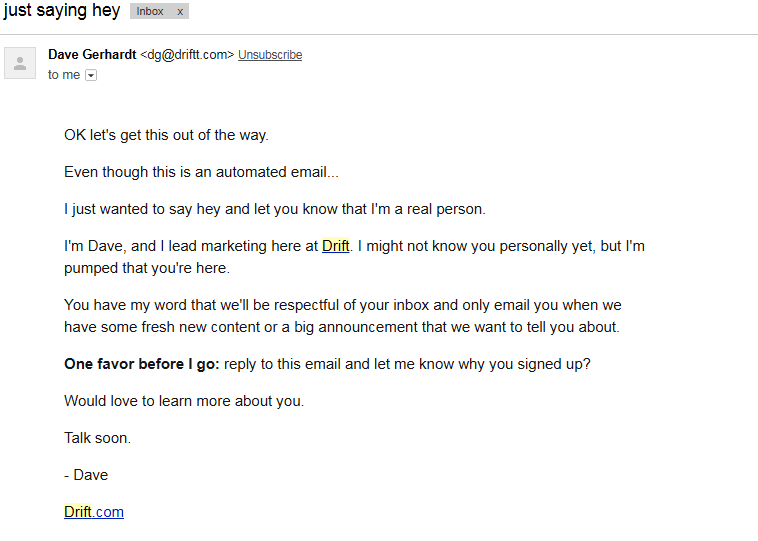 Why personalize emails? An Experian Marketing Services study says personalized emails deliver 6x higher transaction rates. Also known as one-to-one marketing, personalized email marketing reflects a consumer’s previous interactions with your app. It tailors your email content to individual subscriber needs based on their demographics, behavior, and engagement. 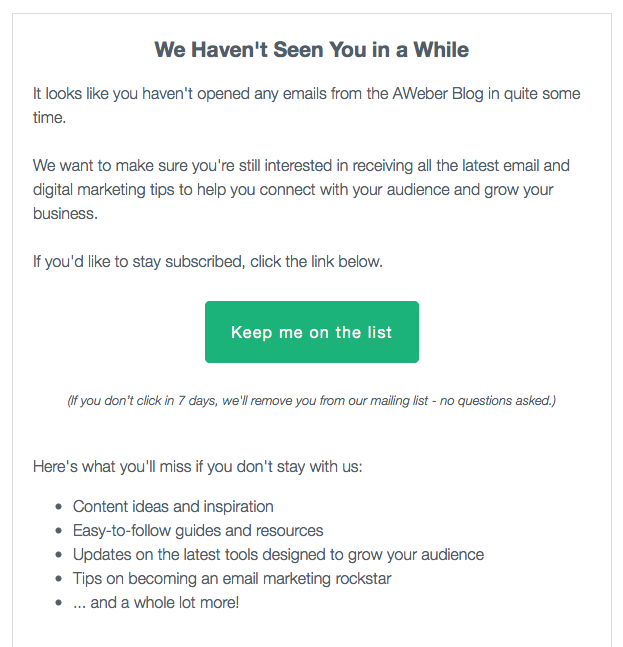 Mass emails blasted to subscribers are not as effective or profitable in comparison. One way to personalize onboarding emails is to send custom reports reflecting the activities of subscribers. RescueTime, a time tracking app, does this beautifully. It monitors websites and apps you use and logs the time you spend on them. 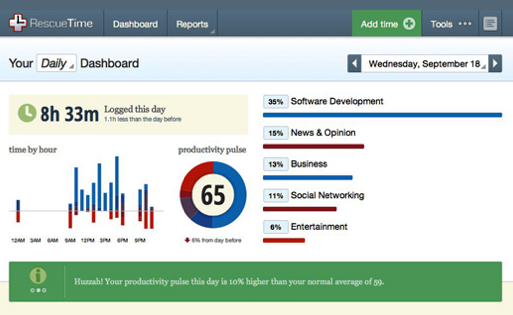 It then generates daily or weekly (depending on your product choice) reports based on how you spend your time. This is a highly personal and powerful way to deepen subscriber engagement. This report is delivered in-app but it can be sent as an email. 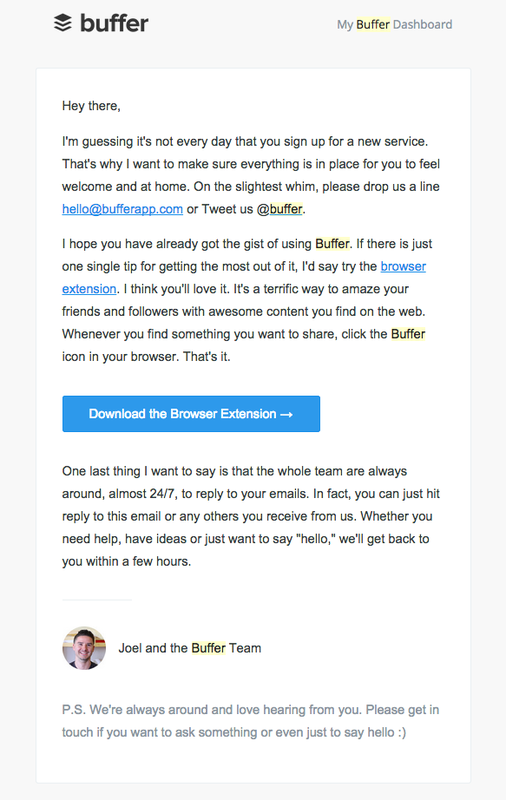 Timely – Customer onboarding emails that are sent immediately a user acts perform best. Research by SeeWhy, a behavioral marketing company, suggests that you have a window of 90 minutes before the lead goes cold. 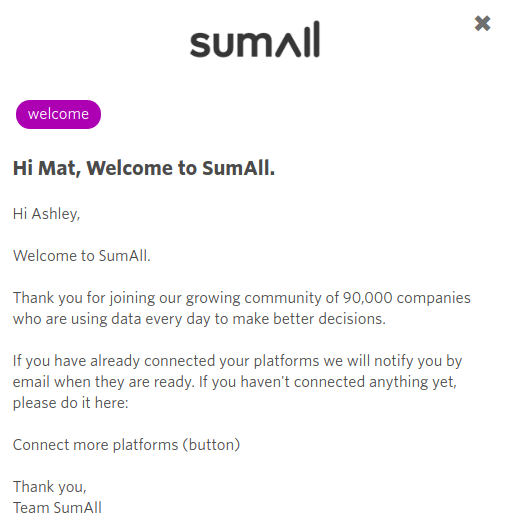 Send your welcome email as soon as the user hits “sign up.”Prodpad, a product management software, experimented with sending its welcome email 10 minutes after sign up and the results have been phenomenal. Trigger-Based – These are emails triggered instantly by user activity or after several days of inactivity. Basically, every stage of the sequence is triggered by the user’s activity or inactivity. For example, when a trial user logs in after a week of inactivity, they might automatically get a personalized email welcoming them back. On the flip side, if a trial user does not login after a week, they might automatically get an email reminding them to log in. Trigger-based emails have open and click-through rates twice as high as that of non-targeted email campaigns. 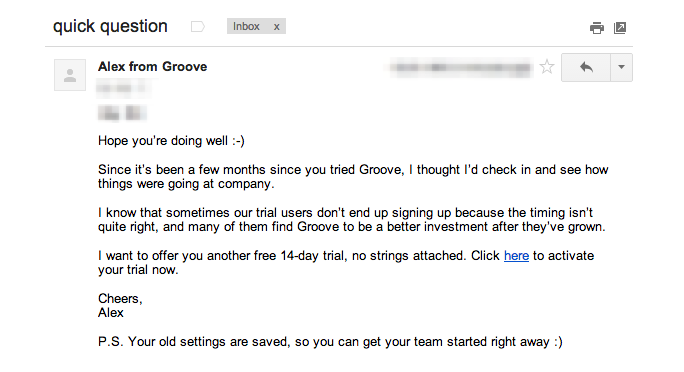 A few years ago, Groove, a helpdesk software, had a low conversion rate. To remedy the situation, the company redesigned its onboarding email sequence based on behavioral triggers. The result? A 10% increase in end-of-trial conversions. This SaaS onboarding checklist works, whether you’re a startup or established business. You must research and understand your customers before composing an onboarding email sequence. Start paying attention to how people are using your app, and what actions ultimately lead to conversions. Just as banks have the KYC (know your customer), you’ve got to gather customer data and usage metrics including but not limited to the length of the first login, frequency of logins, stage of product adoption, number of customer tickets submitted, features used, emails replied to, last login times, number of text and email reminders generated, etc. You can segment users based on their interaction with your software. You can then use their behaviors to predict their next move and act on it. You’ve got to prioritize segmentation to ensure you’re sending the right content to the right people at the right time. It makes every email to add value. You can also leverage the data in your CRM and e-commerce solutions to create personas or user profiles. This segmentation ensured the right content went to the right people. It also increased click-through rates from 1% to 16% while average open rates went up from 27% to 41%. Customize one email sequence according to user behavior. A user who logs in three times per day from day one shouldn’t get the same emails as a user who has never logged in after that first session. Users who sign up for a free trial receive a welcome email. Inactive users receive re-engagement emails. Users who complete a free trial receive an evaluation email. Users who abandon a purchase/cart receive an email urging them to complete the process. 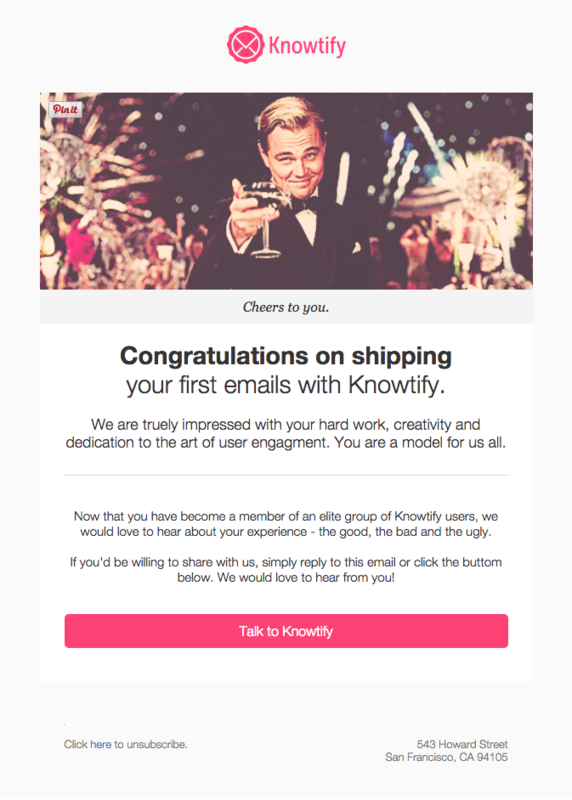 Users who achieve success through your solution receive congratulatory emails. Customized emails make engaged users feel more rewarded for their behavior. Don’t be afraid to sell. Make your emails act as your online salesperson. 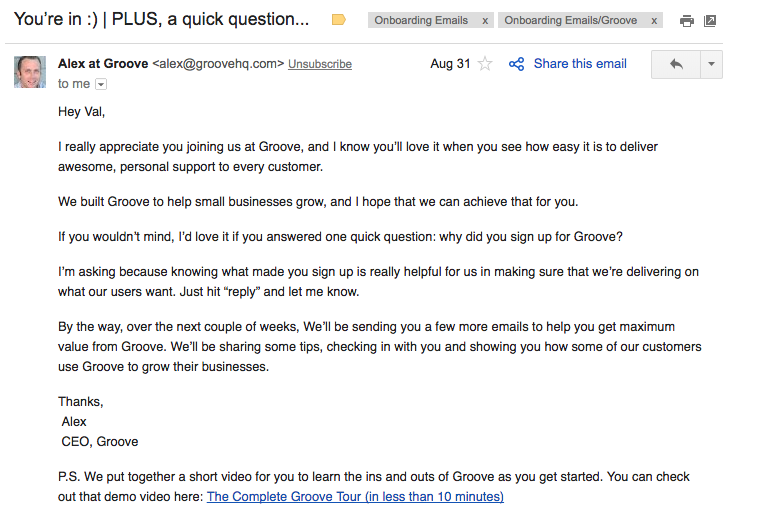 A few years ago, Wistia, a video hosting service, had a conversion problem and the major culprit was its email copy. 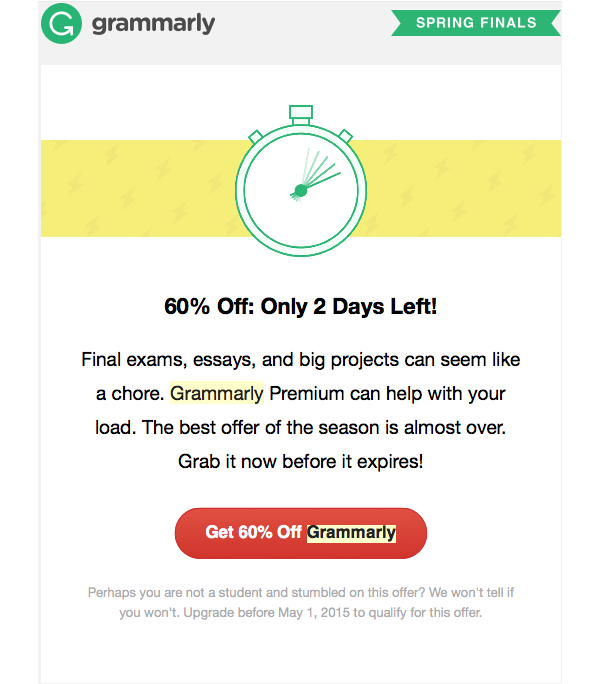 Pricing was right and the brand was strong but the trial email wasn’t just converting. It then optimized its email copy to act as an online salesperson. This brought in a 350% lift in paid conversions. Give your email address an avatar and avoid sending messages from a no-reply email address. Avoid multitasking your trial users. Don’t confuse them by having multiple call-to-actions in the same email. Ask them to take one step at a time, in your bid to help them record their first success. ConvertKit has got this down to an art. Every customer onboarding email the app sends contains one email marketing tip. Talk about clarity and a single-minded focus! A simple plain text email with a single CTA has a high chance to land in the Gmail’s primary folder. It’s a good practice to send personal emails for higher conversions. You can read about tips to land your emails in the primary folder. Keep sending emails to trial users even if they don’t convert immediately. Skillshare, an online learning platform, does this beautifully (without nagging users). 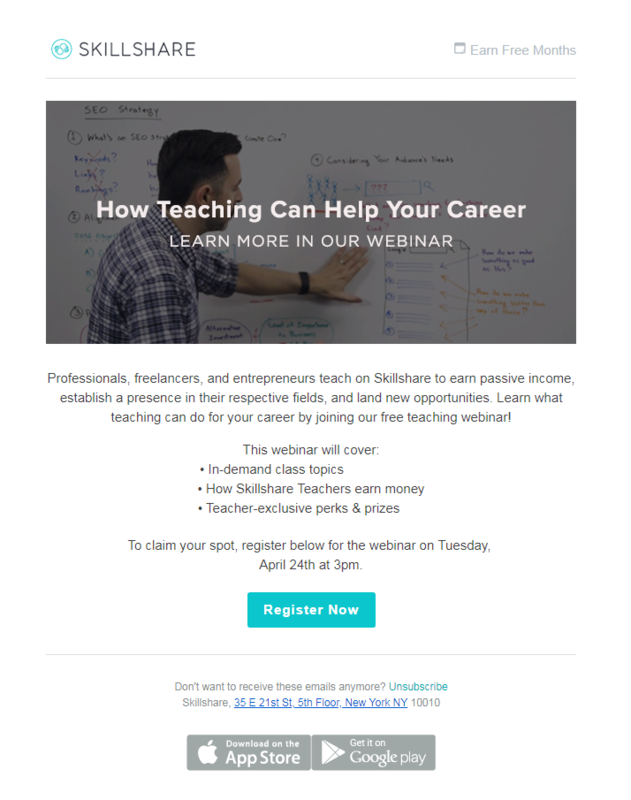 They continue sending valuable emails (inviting you to webinars and informing you of new classes) even if the standard onboarding campaign does not convert you. You can do this until users unsubscribe. SaaS brands that implement these best user onboarding practices see higher engagement rates, increased revenues, and a better overall customer experience. So, which of these tips are you going to start with?